PostScript originally required that hints should not overlap. Now it requires that any active set of hints be non-overlapping, but it allows you to change sets as you move through the glyph. So to implement hinting with hint substitution FontForge needs to know not only the position and width of the stem being hinted, but also where the stem should be active. And it needs to know what stems overlap which other stems. 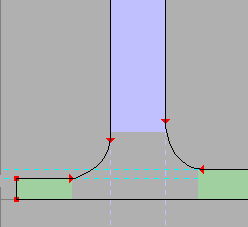 The horizontal stems are drawn in light green. The vertical stems are drawn in light blue. The areas where the stems are active are filled in as rectangles, outside of that area the stems' outlines are drawn with dotted lines. Most of these stems do not conflict with any other stems, but two, the bottom two horizontal stems conflict with each other. All the non-overlapping stem hints may be active at the same time, but only one of the two conflicting stem hints may be active. As FontForge outputs the glyph it decides at each point what stems need to be active, and activates them. PostScript now allows FontForge to control relative counter sizes. Counters are the spaces between adjacent stems. In the example at left there are two counters of equal sizes between the horizontal stems on the left, and three counters of equal sizes on the right. These form two independent counter groups, and FontForge's Hints->Auto Counter command will generate a counter description for each of them. You may also control the counters directly by using the Counters pane of the Element->Char Info dialog. Counters spaces appear between vertical stems too, and in this case FontForge would output one counter group for the vertical stems. One of the major advantages of hint substitution is that it allows certain standard serif situations to be described. In the example at right, the serif one the left is smaller than the stem a bit further right. 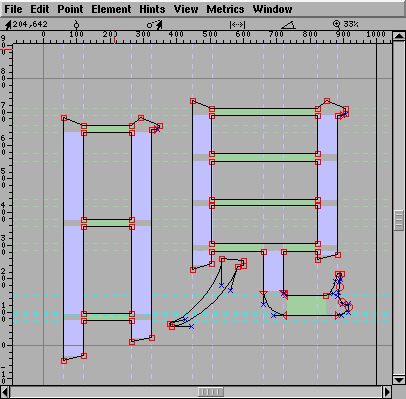 FontForge's AutoHint command can be used to figure out horizontal and vertical stem hints. It will also find hint substitution points (if any are needed), and will check for the simple counter description allowed by OpenType for non-Asian fonts (the equivalent of h/vstem3 hints in type1 fonts). Whenever you change a glyph FontForge keeps track of that fact that the hints are out of date (when you autohint a glyph, or make a manual change to the hints FontForge resets this flag). If you generate a postscript font from something that contains glyphs with out of date hints, then FontForge will automagically regenerate them. This may not always be appropriate. You can turn this off in general with the AutoHint preference item. You may turn it off for an individual glyph with the Hints->Don't AutoHint command. I hope that the FontForge's autohint command will be good enough that manual efforts will not be needed. But hopes like this are rarely fulfilled. The AutoHint command should find all stems in a glyph. Some of them it deems to be useless and will remove them. If you find that FontForge is removing a hint that you think is important then invoke Hint->AutoHint with the shift key held down, this will tell FontForge not to prune any of the stems. You may then use Review Hints to prune things yourself. If you find that you must create your own hints, FontForge will only allow you to specify the position and width of the hint, it will then go off and try to guess the extents where the hint should be active. Create a horizontal hint starting at an arbitrary y location with an arbitrary vertical width. Create a vertical hint starting at an arbitrary x location with an arbitrary horizontal width. Review all your hints, manually changing or removing any (or all). Once you have made a manual change to a glyph's hints with any of the above commands, that glyph will be marked "Don't AutoHint" until you explicitly call the AutoHint command on it. You may also explicitly use the Hints->Don't AutoHint command to turn off FontForge's automatic hinting attempts. These do not set the "Don't AutoHint" bit. FontForge's Hints->Hint Substitution Pts command will automatically figure out where hint substitution should occur, but if this isn't good enough you may do it manually with the Element->Get Info command (when the selection is a single point to which you want to attach a hintmask). 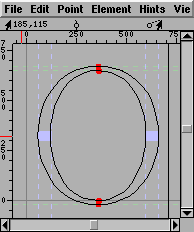 If a glyph has conflicting hints then the first point in the glyph (the first point on the first contour) MUST have a hintmask attached to it. If it does not, the FontForge will automatically figure substitution points when it generates the font. Other points are not required (but may) have a hintmask. 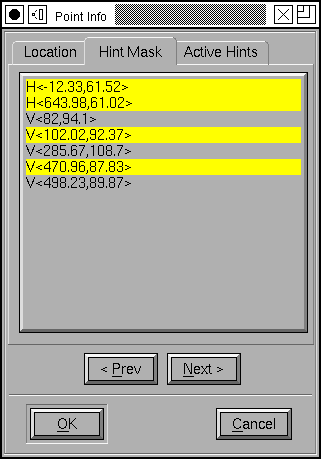 The hintmask specifies what hints should be active when that point is positioned, and will control all subsequent points until a new hintmask is established. So in the following example, the selected point (on left) has the highlit hints active at it, In the glyph view the currently active stems are drawn much darker than the inactive ones. Points with hintmasks attached to them have circles drawn around them. Remember to hold the control key down when making disjoint selections. FontForge also has a Hints->Auto Counter command which tries to figure out what stems form a counter group. Again you can do this manually, with the Counter pane of the Element->Char Info dialog. When creating a new counter group you are presented with a dialog very similar to the one above in which you must select a set of hints that bound a set of counters. This contains font-wide hinting infomation. Things like: The standard width of a stem in the font (StdVW, StdHW), The standard height of capitals and lower case letters (BlueValues, OtherBlues), and so forth. These live in the PostScript Private dictionary. Once you have hinted your font fontforge can generate reasonable values for these settings (But you must have hinted the font first!) -- See the [Guess] button in the Element->Font Info->PS Private dialog. Then once you have generated BlueValues you should rehint the font (the hints depend on the BlueValues, just as the BlueValues depend on the hints:-). 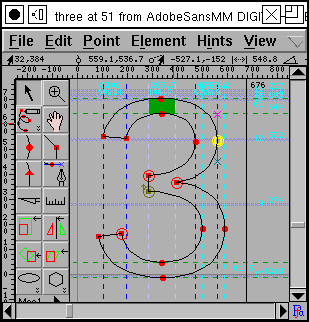 Hints and previously existing fonts. FontForge will not be able to convert TrueType instructions into PostScript hints when it reads a TrueType font (the format is too complex, there are too many possibilities, instead FontForge stores all the truetype instructions and writes them back out uninterpretted). From a Type1 font it will happily read all the hints in a glyph, and keep track of hint substitution points. It will not read counter hints though. In an OpenType (Type2) font FontForge will read in all the hints, keep track of hint substitution points and the counter hints. FontForge can auto-instruct a truetype font (Hints->AutoInstr). FontForge also allows you the somewhat arcane practice of editing glyph instruction programs directly (Hints->Edit Instructions). FontForge's Auto Instructor bases its output on the PostScript Stem Hints, the contents of the Private dictionary, and diagonal stems. You can create diagonal stems manually (Hints->Add DHint), or you can let the autohinter do this for you (File->Preferences->PSHints->DetectDiagonalStems). Please look at the page on instructing fonts. I find the hint documentation inadequate for me to do a good job at hinting. Section 2.4 of T1_Supp.pdf says that vertical counters are offset from the lbearing, but the example 2.6 shows them being offset from 0. In Type2 is it ok to use Counter mask if LanguageGroup is not 1 and the stems don't fit into a *stem3 pattern? Or can cntrmask only be used for *stem3 in latin letters? How do hints work? Is a hint meaningful if there are no points associated with it? As in the "O" at right, where the two vertical stems have no points associated with them. Is it meaningful for a hint to have points only on one side of it? Can reasonable hints be written for the serif cap above left? Overview of Hinting in PostScript and TrueType.